Rob Ford, age 46, is currently a city councillor for Ward 2, Etobicoke North in Canada. Having had a quick descent from grace, just last year he was Mayor of Toronto. However, Ford’s occupation quickly changed in a series of events that ultimately exposed him as an addict. It is important to understand that substance abuse and addiction can affect any person worldwide. The National Post reported that after months of scrutiny of alleged substance abuse and addiction, in 2013, Rob Ford admitted that he was addicted to drugs and alcohol. It is important to understand that substance abuse and addiction can affect any person worldwide. Addiction needs to be acknowledged as a disease so that individuals can receive the proper treatment and achieve long-term sobriety. Over a series of five years, Ford had a variety of alleged rumors swirling around his mayoral seat and sobriety. The main catalyst was in 2010 when he admitted to being charged with a DUI for drunk driving with marijuana while in Miami, Florida. An article by CBC News states that even after a video surfaced in 2013 and Ford admitted to smoking crack cocaine, he remained Mayor for a few months afterward. Ford was forcibly removed from his mayoral seat once Toronto City Council restricted his powers. All of Ford’s vices, along with a cancer diagnosis, aided in his fall from mayor. Erratic behavior and a variety of other incidents while in office were signs of Ford dealing with some sort of substance abuse issues. Since his cancer and election as councilman, Ford has used his story to inspire other addicts. Ford, who portrayed himself as a traditional family man, is not unlike many others struggling with substance abuse. Those combating addiction can be fathers, brothers, supervisors or mayors. Addicts try to keep their addiction problem hidden until those around them start to see signs of the issue. Cocaine is a highly addictive drug derived from the leaf of the Erythroxylon coca bush. The drug was a prominent ingredient in many mainstream substances in the early 1900’s. It was used in a variety of medicines and in Coca-Cola. Although it reached its peak usage in the 1970’s and 1980’s, it is still popular today. 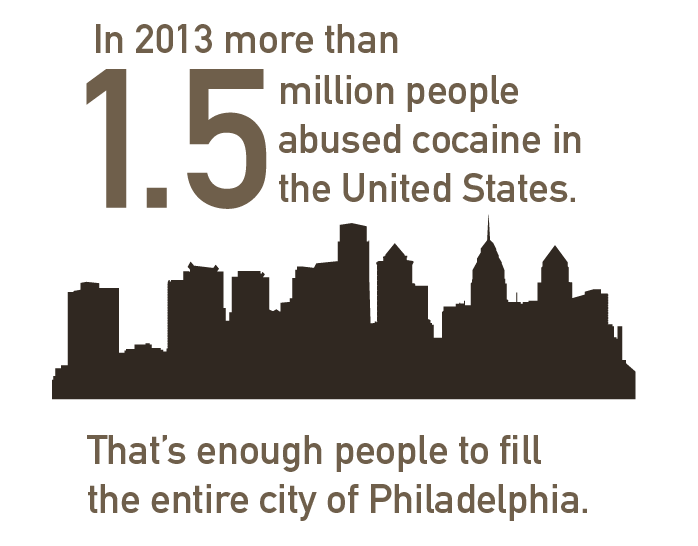 In 2013, over 1.5 million people age 12 and over abused cocaine in the United States. Though they are often referred to as separate substances, crack and cocaine are two different forms of the same drug. Cocaine is a white powdery substance; crack is a type of processed cocaine that is formed into a rock-like crystal. Crack is cocaine that has been processed with a base, such as baking soda, to remove some of its properties. This enables it to be more quickly absorbed when smoked. Cocaine can be snorted, smoked or injected, crack can also be ingested in those ways, but is most commonly smoked. It has direct effects on an individual’s brain. Psychology Today explains the wide-range of short-term and long-term side effects of cocaine and crack abuse. High blood pressure, constricted blood vessels, heightened heart rate and an increased body temperature are common effects. Violent and bizarre behavior also is an indicator that someone may be addicted to cocaine. The more cocaine is used the more erratic an addict’s behavior can become. The more an individual abuses a cocaine, the higher their tolerance increases. This leads to needing more amount of the drug to feel the effects the high. Using more cocaine in turn, increases chances for overdose and death. The article also highlights the effects of long-term use. Nosebleeds and even loss of smell are two common occurrences for those regularly snorting cocaine. Cardiac arrest, seizures, paranoia and auditory hallucinations can occur as well. Psychology Today also suggests that those who use crack may have some other physical issues, due to the fact that it is most commonly smoked from a pipe. Addicts may experience blistered lips, tooth decay, respiratory failure and liver disease. Addiction is not a disease that only affects an addict; it affects everyone around them as well. Children and spouses can manifest long-term psychological issues due to enduring the volatile and erratic behavior of an addict. The article, titled Living with Addiction by Tian Dayton Ph.D., explains that living with an addict can be a traumatizing experience that may even lead the child or partner to begin using to cope with the addict in their own family. Many times children can become severely depressed or manifest feelings of guilt, erroneously believing that they possibly caused a parent to begin abusing a substance. Dr. Dayton states that living with an individual abusing a drug abolishes the ability to create a standard of normalcy within the home. Children may not know who to turn to and spouses can become resentful or even neglectful of their duties due to anxiety or depression that they are experiencing from a partner being an addict. This is why it is important to address issues such as a cocaine or crack addiction. Addiction not only affects the individual, but it also affects their whole family unit as well. There is a variety of programs and treatment options, such as an intervention, to aid in the recovery process. Seaside Palm Beach is a luxury, resort-like facility catering to every need of a patient entering rehabilitation. From gourmet meals and world-class suites to beautiful views and renowned physicians, our comprehensive, holistic approach to treatment has been a successfully proven method for over two decades. Seaside Palm Beach has developed a multitude of unique therapies that any patient will see as helpful. We also believe in promoting living recovery. This means that we allow individuals within our facility to continue using laptops and cell phones as a means of communication and tools for work while they are in recovery. To learn more about Seaside Palm Beach, please call (888) 997-3274.